Following our two earlier posts showing how discussion of Hurricane Sandy were reflected on Twitter, we present another representation of tweets, focused specifically on how New York City -- the center of both the storm's effects and the media attention around it -- tweeted about the storm. The following map includes a broader temporal range of tweets dating back to last week on October 24th, up to approximately 1:22pm on Tuesday, October 30th, as the storm was starting to subside and damage be more closely assessed. Tweets included in this dataset contain direct reference to "Sandy" and include more-or-less precise latitude/longitude coordinates (as opposed to being geocoded to less specific scales such as the city or neighborhood level), allowing a greater level of precision, despite sacrificing a significant number of tweets in order to do so, though still leaving us with nearly 16,000 individual observations to work with. In order to show density as opposed to individual points, tweets were then aggregated to the level of census blocks. 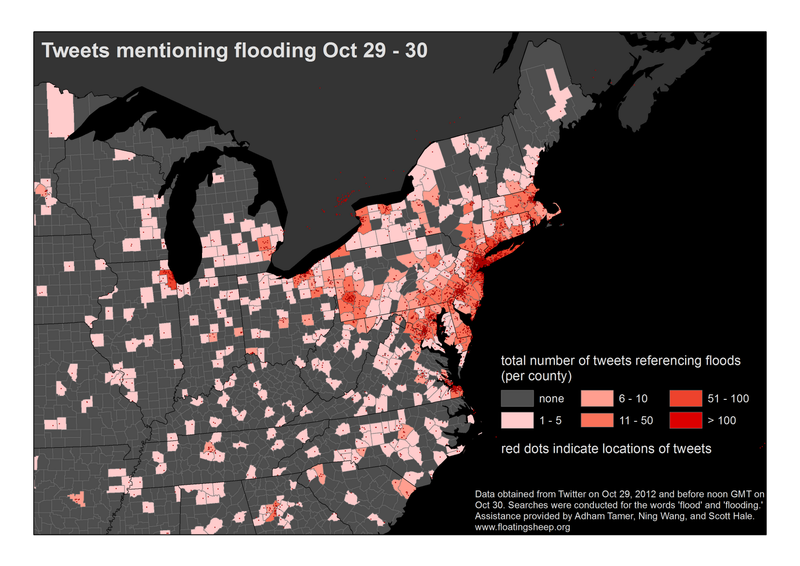 Although we definitely see some larger clusters, it is remarkable how spatially dispersed the tweeting about Sandy was. The majority of tweets are located in midtown Manhattan, which was not only the location of the last open Starbucks in the city, but was also hit by widespread power outages. 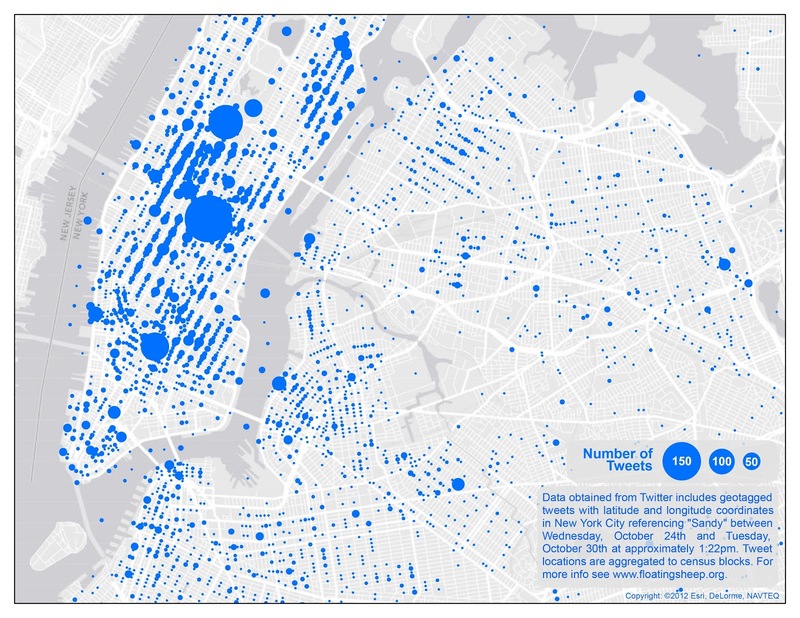 The concentration of tweets around the southern tip of Central Park are likely caused by the infamous dangling crane (and subsequent evacuations) at 57th Street. While some areas that were hit by flooding see a pattern of increased tweet activity -- for example Battery Park, Dumbo, LaGuardia and Hudson River Park -- it is surprising how few tweets we find in areas that were hit especially hard or where significant events happened. In Breezy Point (not included in the map) a fire destroyed more than eighty homes, but only a handful of tweets come from that same location. Similarly, Sandy inflicted very significant damage to large parts of Rockaway and Coney Island with very little mention in these places on Twitter. Other major events covered by the media, such as the evacuation of the NYU Medical Center just north of Stuyvesant Town or the explosion at ConEd's power station on 14th Street, also see only a few tweets in the immediate vicinity, though perhaps owing to the fact that individuals in these locations would be more concerned about safety than tweeting. It seems that, when zooming in on the urban scale, the location and density of tweets does not necessarily correlate with areas most effected by Sandy. As the hurricane brought the city to a grinding halt, with businesses and schools closing ahead of the storms, Sandy appears to have been tweeted from the -- relatively -- safe confines of the home, as opposed to the many locations throughout the city which were hard hit, but relatively unrepresented in this virtual representation. Ultimately, we're left wondering whether Hurricane Sandy represents a case distinct from that of Hurricane Katrina? Though the areas that were the most tweeted from in this case represent both the most densely populated and most well-off, areas such as Harlem don't mirror the experience of Katrina in being devastated by the storm and then wiped off of the virtual representation of the event. Or, as Mark indicated in his earlier post, is it simply difficult to ascertain much from such finely-grained data in cities? Or, as the relative lack of discussion about the devastation Sandy has caused in the Caribbean indicates, has the location of the storm in arguably the world's most important city simply deflected media attention away from other locations? We don't offer these as definitive conclusions, but instead as provocations, as much deeper analysis needs to be undertaken to more fully understand the relationship between such intensely material events as Hurricane Sandy and virtual representations of them through platforms like Twitter. With the worst of Hurricane Sandy now past, we wanted to build on our initial map of references to "Frankenstorm" and construct a fuller picture of how the storm was represented and discussed on Twitter. The first alternative representation we offer visualizes how Twitter discussed the most obvious impact of the storm, the massive flooding (felt particularly acutely in New York City) that has not only disrupted the every functioning of the city, but also had likely long-lasting impacts on many individual lives and the way we prepare for and attempt to manage such 'natural' disasters. To begin, we have been collecting tweets containing the terms "flood" and "flooding" in order to examine how Twitter usage might reflect lived experiences of the storm. By examining the digital data shadows of an intensely material event, we can hope to gain some understanding of how the intertwining and interfacing of virtual and material spaces apart from the immediate consequences of this particular event. The map reveals a few important findings. First, like the map of references to Frankenstorm, tweets referencing flooding are almost exactly where you would expect them to be; in other words, the vast majority of tweets were located in the path of the hurricane. Nonetheless, it is interesting that so few people elsewhere in the US are tweeting about the unprecedented flooding and resulting damage taking place on the East Coast. In this sense, the geography of data shadows drawn from Twitter appear to be quite effective at reflecting experiences of the storm. The hurricane, in essence, leaves a digital trail. Second, we are able to see that these data become significantly less useful if we want to draw insights at a scale finer than the county level. Until noon GMT on Tuesday, October 30th, there were only 5,209 geocoded tweets about flooding, a fairly small number over such a broad area. We even initially intended to map references in both English and Spanish to reflect the potential differences in experience between different linguistic groups affected by the storm, but despite the millions of Spanish-speakers undoubtedly affected, we were only able to collect five Spanish-language tweets! 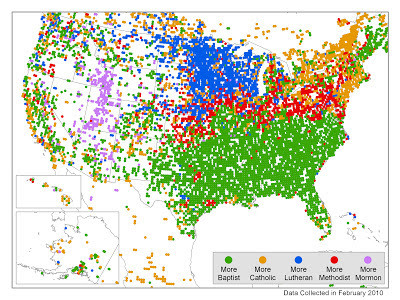 In other words, it is the absences on this map that are almost more interesting than the mapped results. The lack of published content in Spanish means that we are necessarily only including published content from English speakers in these representations. The absences in the rest of the country are also revealing. Why are so few people in Kentucky, Missouri, Wisconsin, etc. tweeting about East Coast flooding? Is it because the act of tweeting about such an event is only really likely to be performed by people in situ, experiencing the storm? Are people outside the direct path of the hurricane interested in other impacts apart from flooding (for instance, the significant snowfall in parts of central Appalachia)? Are they interested at all? Or does the necessarily limited representation offered by Twitter constrain any possible explanations? As some of us hunker down in our fortified bunker in Worcester, Massachusetts awaiting the Frankenstorm, and others hang out in the California sunshine, we thought we'd contribute our collective two cents to the discussion of the ongoing storm via mapping -- from Google's crisis map to the New York Times' map of the hurricane's expected path -- in the form of a visualization of Twitter activity around the storm . It didn't take long for the term "Frankenstorm" to catch on. Shortly after the National Oceanic and Atmospheric Administration first used the term this past Thursday, the first geotagged tweet was created by @SStirling, a data journalist for the Star-Ledger newspaper in Newark, NJ, around 11:06am that day. 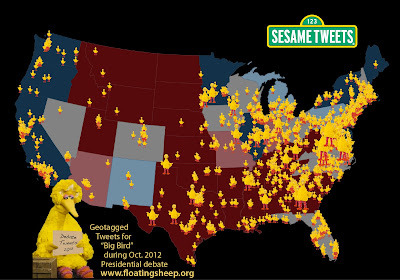 Since then, well over 7,000 geotagged tweets referencing the Frankenstorm have been created in North America. The dataset used here includes exactly 7,056 geotagged tweets collected from DOLLY, from the very first mentioned above until approximately 12:36pm EST on Monday, October 29, just as the storm was starting to pick up along the east coast . 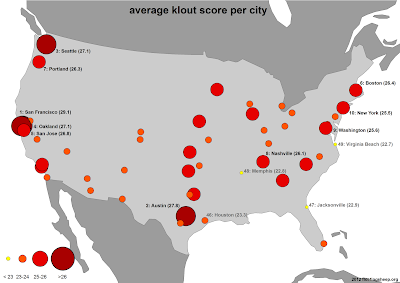 After aggregating the tweets to the county level, a quick glance reveals some striking, if not unsurprising, patterns. Despite being a major national news event, Twitter activity around the storm has been incredibly concentrated along the east coast where the storm is expected to hit the hardest, demonstrating a clear connection to the places in the path of the storm. While itself not surprising, the precise level of concentration is a bit more startling. Indeed, over 40% of the total number of geotagged tweets referencing Frankenstorm in this sample come from just eight counties along the east coast. And while these counties represent four of the ten largest metropolitan areas in the United States, and the four largest along the east coast, the concentration within these areas demonstrates the extent to which areas which might be just as hard hit -- such as rural Vermont during 2011's Hurricane Irene -- are relatively underrepresented in the virtual reflection of events such as these. But perhaps more interesting than the cluster of references along the east coast is the anomalous concentration of references all the way across the country in southern California. Just 23 counties across the United States had more tweets referencing the Frankenstorm than Los Angeles, which had 46 tweets, breaking up what would otherwise represent a clear effect of distance decay in predicting the number of tweets referencing the Frankenstorm. In contrast to the relatively concentrated pattern discussed above, a cluster of references comparably significant to areas of Maine, Pennsylvania and Virginia pops up around over 2000 miles away from the path of the storm, while areas in between in the American south and midwest show no such clusters. Though L.A.'s large population makes this concentration of activity somewhat less surprising, the city's position within the national (and global) urban hierarchy offers a somewhat more interesting (at least to geographers!) explanation. When considering L.A.'s centrality within the global air transportation system and the fact that thousands of flights have been affected by the storm, there emerges a range of alternative explanations emphasizing the relationship between Los Angeles and the cities along the east coast more directly affected by the storm. For instance, at least a handful of tweets, like those below from @robyntomlin and @paulhogarth, specifically reference air travel from Los Angeles to the east coast and into the path of the impending Frankenstorm. So while the analysis presented here is more a confirmation than a revelation, it clearly shows the persistent connections between space and place in online networks like Twitter, as well as how geotagged Twitter content represents a promising way of demonstrating these connections between the virtual and the material. With the worst of the Frankenstorm still yet to come -- as are thousands more tweets, we're sure -- we hope everyone continues to stay safe and dry in the coming days... and that someone goes ahead and starts working on the next ridiculous name for a major storm so that we can do this again in the future! Despite there being a range of possible keywords possible here -- such as "Hurricane Sandy" itself -- we, in typical Floatingsheep fashion, chose only to map the more ridiculous "Frankenstorm". As such, the analysis here is tempered by this limitation. No members of the Floatingsheep collective were harmed in the making of this map. Taylor did, however, bravely venture out into the Frankenstorm to make it to the office in order to produce these maps, and his pants were appropriately drenched for this effort. New article on Religious Cyberscapes published in The Professional Geographer! In what will go down as a shining example of need for patience when dealing with the world of academic publishing, Taylor, Matt and Mark's article on religious cyberscapes has finally been published in the print version of The Professional Geographer... and one issue earlier than expected at that! While the online-only version has been up for just over a year already, we're happy to have this paper finally reach it's conclusion, nearly two years after its acceptance and well over two and a half years from the time we started working on it. If you have institutional access, you can find the article on The Professional Geographer's website. If not, get in touch with one of us and we'll satisfy your sheepish craving. Like Mitt Romney in Tuesday night's debate, we were wondering, where are the "binders full of women" applying to work at FloatingSheep? So, despite the many memes devoted to binders full of women and the news coverage of these "viral" memes, there are no women actually in binders. Women live in the material world. 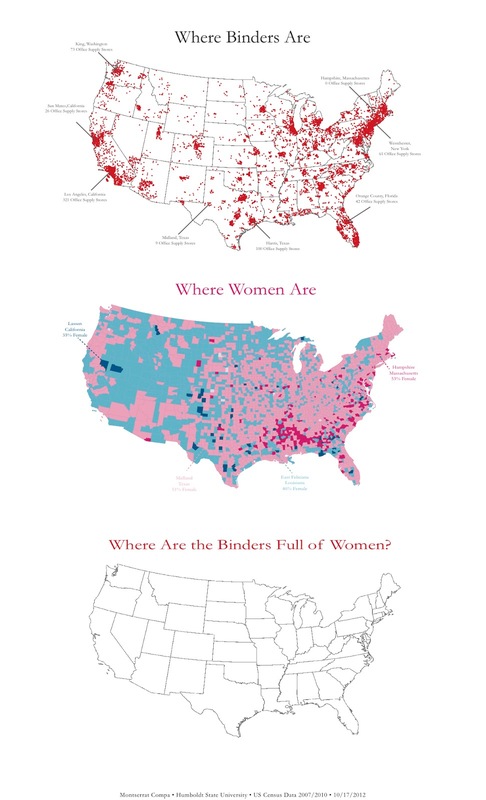 But just as Mitt Romney is able to represent women as being in binders, there are plenty of women (and people who like women) on Twitter producing counter-representations, as UK Geography grad student Ryan Cooper discovered with this map of tweets referencing the latest presidential debate screw-up. Here at the Floatingsheep virtual compound (located somewhere in wilds of information space between 163.1.201.42 and 137.150.145.240) we are avid followers of the changing trends with culture and politics, particularly as they manifest in the online world. So it should come as no surprise that we have been tracking the U.S. presidential election over the past months. 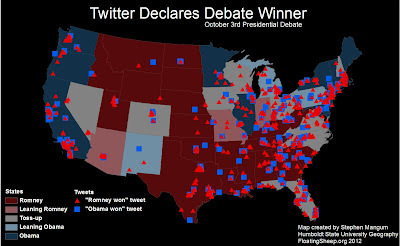 We were particularly interested by the extent to which Twitter featured in media coverage of the first presidential debate and wanted to take a look at the geography of debate tweets. Moreover, given our general solidarity with all farm yard animals we also wanted make sure we had Big Bird's back . So we fired up the interface to the DOLLY project, which just archived its billionth geocoded tweet last week, to take a look. By the way, if you are interested in working on maps like this yourself, be sure to check out the Sheepallange. But before getting to our work let's take a look some other non-geographic work. 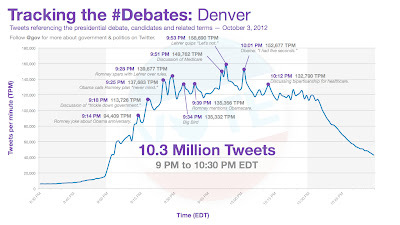 The debate was clear a trending topic on Wednesday night with over 10 million tweets sent and this temporal dimension is well illustrated by the graph below and the analysis of Twitter itself. 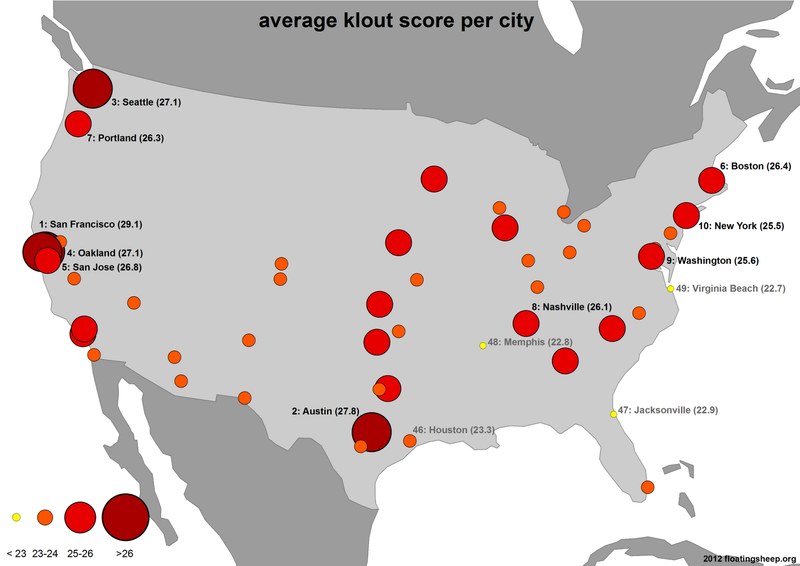 While there are issues with the representativeness of the Twitter universe, it is useful metric to watch. 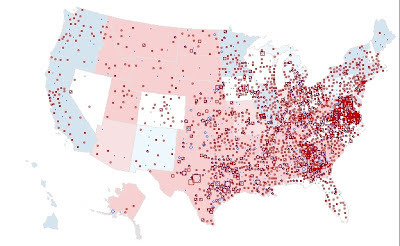 As geographers, however, we wanted to examine the spatial dimension of these tweets, particularly with respect to the handful of swing states (according to CNN) that have are key in the upcoming election. So we commissioned, at great expense, a series of maps created by Monica's cartography students at Humboldt State University . 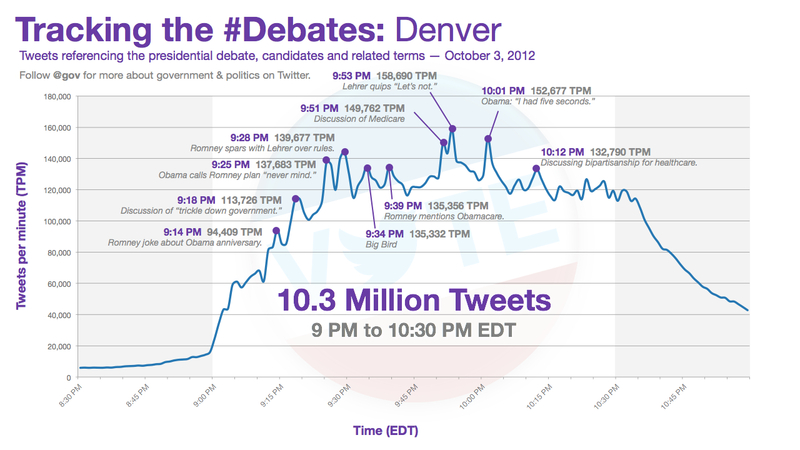 The goal was to demonstrate the geographic expressions of online political engagement as evidenced by debate-related tweets. Catherine Hoyle, a Humboldt State Oceanography major, looked at where people geotagged tweets for Obama or for Romney. 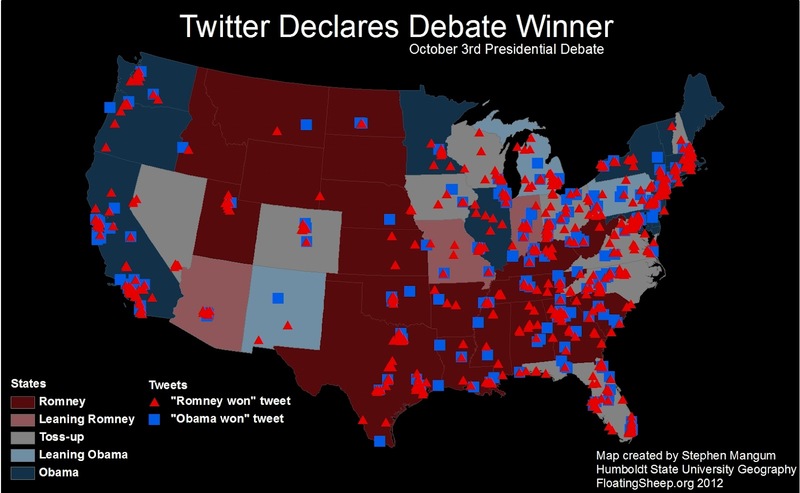 Stephen Mangum, a Humboldt State Geography major, examined the tweets declaring either "Obama won" or "Romney won" in relation to the political leaning of the state. While the maps above are certainly illuminating, truth be told they skirt the key issue of the candidates' stances on the future of Serinus Canaria Sesamestreetous, with an apparent glandular disorder resulting in extreme size, i.e., the attack on Big Bird by Mitt Romney. We stand in solidarity with our feathered friend, who is a long time advocate of the sheep community. As the video clip below demonstrates, Big Bird has regularly and eloquently spoke out for sheep. "Are you worried about sheep like I am? Well I've been thinking about it a lot, so I wrote a poem, and I'll read it to you so you'll see what the problem is here." Montse Compa, a Humboldt State Environmental Science major, was also worried about Big Bird's employment prospects if Romney wins the election (as Twitter predicted in Stephen's map). On this map the larger the size of the Big Bird the more Tweets during the debate about Big Bird. And worse, make her a debtor. OK, technically a canary is not a farmyard animal, but where else are you going to be able to put Big Bird? Actually there was no expense in this. It just sounds better that way. First, apologies for the lack of updates to the blog. We've been rather busy this fall and as a result have had fewer really good maps/analysis we wanted to share. But this will change relatively soon as we get the visualizations from the DOLLY (Data on Local Life and You) project ready for prime time (or at least blog time). Until then we wanted to pass along a show made by our friends over at the "Science...sort of" podcast in which Monica, Ate and Matt discuss the beer versus church twitter map. Fun/science is had by all and for a little je ne suis quoi, there is additional discussion about the effect of nuclear bombs on beer. Check the podcast here and we'll bring back the maps soon, including the SHEEPALLENGE.